Hi friends! 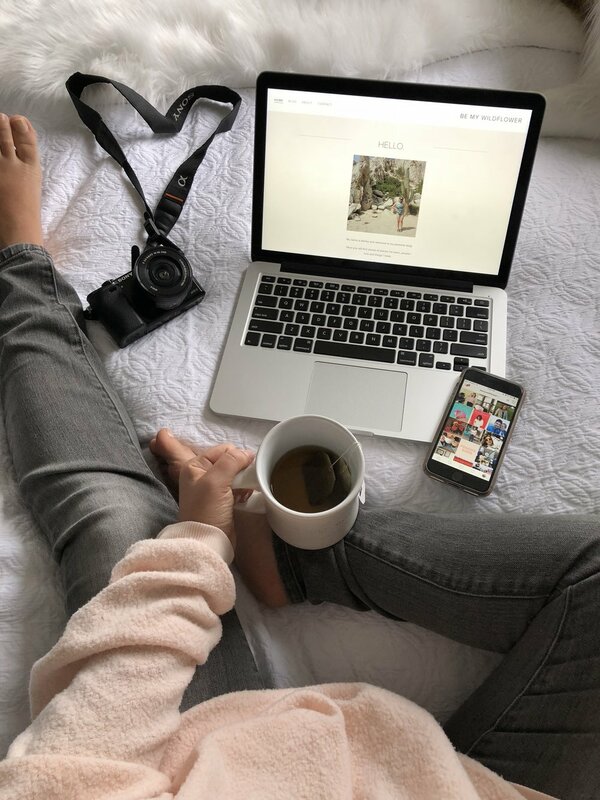 I have written this blog particularly for some people that have asked me questions about how to start a blog, grow a following and to promote a blog as someone starting out. Now obviously I have very little experience considering I, myself just started in March. But this is what I have learned so far from other great bloggers and through experience. I have found this information helpful for me and I hope it helps you as well! My girl Jess over at Wild.Bloom has been an incredible resource and mentor. I have asked her SO MANY questions and I am just so grateful that she has been so patient, kind and willing to share with me things that have worked for her! In the past I was always under the impression that if you made creative and/or high quality content the followers would just come. This just is not true at all. I have come across accounts with amazing content and just 100 followers because they are missing the engagement quality and the self promotion piece (which I will go into a little later). What is engagement on social media? Engagement is a reference to one's participation in whatever platform they are on. This can be a matter of likes, comments, hashtags, messaging and stories if you are on instagram. If you take away anything from this post, know that engagement is important. This is what will drive traffic to your page. I almost look at it as a way of networking. The more people you meet, the more you get your name out there the more likely you are to gain an organic following. But know that everything needs to be sincere. Just commenting "nice" or messaging, "pretty feed!" to people isn't going to get you very far. Comment on something specific you like and try to make a genuine connection. Invite people to engage with you as well! Ask questions in your captions or make a call to action. Take advantage of polls in your Instagram stories or involve people in blogs you are writing. You want to keep your followers invested. Also, don't forget to like photos back and always respond to comments! Self promotion is also incredibly important. I am learning this as I go and I have found a lot of success in promoting myself through Pinterest, Facebook and Instagram. As of right now, most of my blog traffic comes from Instagram so I do my best to post daily, sometimes even twice daily, and I always try to have a story going. If you saw my personal Instagram account you would see that I hardly ever post, barely put anything up on stories and only like the pictures that people I am following post. After just 3 months I have almost double the followers on my blogging account compared to my personal account and I have had my personal account since 2014. Blogging Facebook groups have been great as well because they have specific posts meant to promote your blog or Instagram which has helped me grow my following. To be honest I still feel quite awkward or silly posting to Instagram stories but I have found great success in it and I have actually met a large handful of people who reply to almost every story and have made great connections because of it. Sometimes the stories where I feel most "dumb" have actually gotten the best response. If it is something you feel insecure about it is also probably really relatable and I have found that the risk of looking dumb is almost always worth it. Not to mention it has made me very comfortable being myself very quickly, and in real life I can often be dumb and silly. Different bloggers will say different things but here is what I have learned. A niche is important but not necessary. In fact I wouldn't even say I have found my niche. I don't have a feed dedicated to food, fashion or anything in particular really. It is a place for me to take pictures I feel like taking and post what I feel like posting because right now I am just focusing on what I am enjoying and that is creating and telling stories. What I have found to bring everything together, or at least how I am trying, is through narrative of my every day life and the things I like. A blogger I follow Helene in Between doesn't necessarily believe strictly in a niche or cohesive feed but rather a story you are creating for your followers. Make a story that your followers can relate to and are excited to come back to. It is amazing to me how many strangers have remembered that I was sick in March. In April when I got really sick so many people messaged me saying that they were sorry I was sick again and that they hoped I was getting better. I was amazed that people remembered this little detail in my life BUT it also made sense because the people that I interact with often and want to follow on Instagram are the people that I make an effort to keep up with, and it makes it easier to remember even the little details. I will say that I think people with a niche and cohesive feed grow a following much quicker, but I honestly don't have anything to back that up except personal observation. All of this being said I am still working and learning how to make a cohesive feed and maybe someday I will have a niche but I am happy with how things are going now. I have had experience with both. I was invited into a pod not too long ago and if she would have asked me to be a part of her pod a week earlier, I would have said yes. For those of you who do not know, a pod is a group of individuals on Instagram who agree to increase engagement on each other's posts by liking and commenting on every post of those in the pod, typically before posting a picture of their own. Each pod has their own rules but the intention is to beat the algorithm by increasing engagement on a photo right away. The idea is that it will make the photo get closer to the top of someone's feed or the hashtag pages the Instagram user added to their photo. Makes sense and sounds great but it just wasn't for me. I am trying really hard to do everything organically and at its own pace. I don't have anything against pods but I like being surprised by the people who comment on my photo rather than expect 10 people to comment and it is fun to make those connections with all of you who consistently comment and visit my page. I appreciate each and every one of you and I am glad we have become friends. Now onto bots. I had my first encounter not too long ago. I was sitting at my desk at work and all of a sudden my phone starting buzzing uncontrollably. I looked down and "like" notifications kept popping up, one after the other, rapid fire. I thought that maybe I had finally gone viral and I all of a sudden new what the Kardashians felt like every time they posted a picture lol. But this was sadly so far from the truth. But I did open up my phone to 100+ notifications on the same picture. At this point I still had no idea what was going on but the notifications stopped so I went about my day. Well that evening I got 80+ more likes on this picture and I was getting suspicious. I checked my email and noticed that someone let me know they did my a favor by giving me all of those likes. Okay, interesting. They told me for just $9 a week they could do this to ALL of my pictures no matter what time of day I posted AND they would do this to my last 10 photos for free. While I was excited to get so many likes on a photo since that has never happened to me ever, I was immediately turned off by the fact that I no longer felt like I earned them, because they weren't real. Again, it wasn't organic which means it wasn't sincere and that is why I am here. So thanks for all the likes, but no thanks. I am just fine with how things are going now. And don't get me wrong - some people like to use bots and more power to them. It just isn't what I'm about and again, I want to stay true to myself throughout this whole process. This is an area where I need A LOT of guidance. I have had companies and small businesses send me free stuff and I have even had a few brands reach out to collaborate but thus far I have turned them all down. You can read about why in my post Why I Turned Down a Paid Partnership. I do not have a lot of insight into this area but once I learn more I would be happy to write a blog about it for you all! Thank you so much for reading! I hope this information is helpful and at the very least gives you a place to start in terms of growing your blog and following. Just remember that if you are finding joy in what you are creating it will be obvious to your followers. If you have any questions feel free to drop them in the comments below and I will answer them all.